You have entered the COSHOCTON COUNTY OHIO OHGenWeb Project! 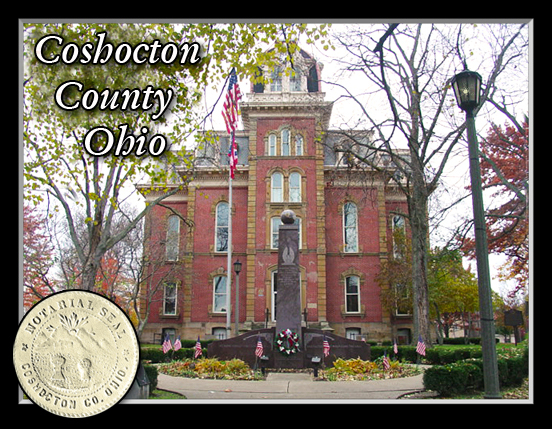 Coshocton County, Ohio, is located in the southern most section of the northwestern part of Ohio. April 1, 1811 Coshocton County was organized from Muskingum County. Coshocton County reached its present boundaries in 1825. Coshocton's Indian beginnings are seen in its name. It is derived from the Delaware Indian word, goschachgunk meaning union of the waters. Coshocton City is at the forks of the Muskingum River where the Tuscarawas and Walhonding rivers unite to form the Muskingum River. Coshocton was once the capital of the Delaware Indians. White settlers from the East moved into the area in 1795. Railroads moved into Coshocton in the late 1860s and the Indians moved West. Sheila Barr Helser is webmaster/coordinator for Coshocton County.